Sunday 21 August. Walberton Pond Start. Ride to Dragons Green. 9 of us started from the Pond led by Colin being myself, Colin, Tom, Steve Thomas, Chris, Steve and Bernie and newcomers Clive and Yvonne. Weather was cloudy to start with but by eleven had cleared to a warm day with blue skies and occasional clouds. Colin led us out via the Spur and Madehurst to Whiteways and then a good fast descent to Houghton. 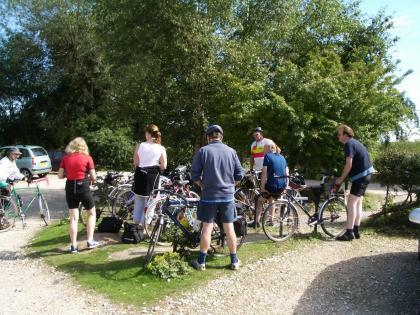 We continued via Amberley to stop for elevenses at Wiggonholt. Alan and Elizabeth joined us at Wiggonholt but made their own way to the Pub. Elizabeth has made her first Bike rides of any length this last week since breaking her arm but her speed is still limited. The ride continued on a fairly direct route via Watery Lane and West Chiltington to arrive at the Pub at 12.01. We returned by way of Ashington and then lanes via Warminghurst to Storrington, Parham Park and Amberley to stop for tea at Houghton Bridge Tea Rooms. This made for a pleasant stop in the Garden at the edge of the river with a couple of Swans begging for food. John Maxim met up with us at Houghton after being over to Trotton for Lunch. On the return to Walberton the mileage from and back to the Pond was 42.5. My mileage from and back to Pagham was 63. Jan deputised for Dave to lead the ride as far as elevenses. She was joined at the Cross by Diana, Kath and newcomer Jeff. The day was warm and sunny with occasional clouds. The riders stopped for elevenses at the Yacht Basin Cafe were Dave joined and led the ride from there. Diana had to return home after elevenses. Dave took the group on backroads and lanes. At the Cafe in Selsey 3 more joined including Lynn and Andrew. The entire group had sandwiches and as the Cafe was full to overflowing they retired to the Beach and a shady spot by the car park. In the afternoon some of the Group stopped at Dave and Jan’s house for tea. Mileage from and back to Chichester Cross was 25. 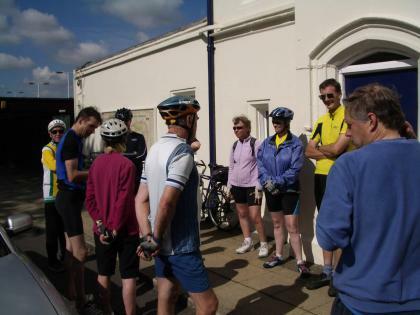 Wednesday 17 July, Evening Ride, Chichester Start. On a beautiful sunny evening there were 9 out on the Ride. The Leaders Freda and Jim and Kath, Phil and Mary, Avryl, Arthur and Lynn and Andrew. The route took in the cyclepath past the College to the station and then down the Canal Towpath to Hunston. Then the new Cyclepath bypassing the roundabout to Runcton. Then more traffic free riding down lanes to South Mundam and a short field crossing to Summer Lane in Pagham. 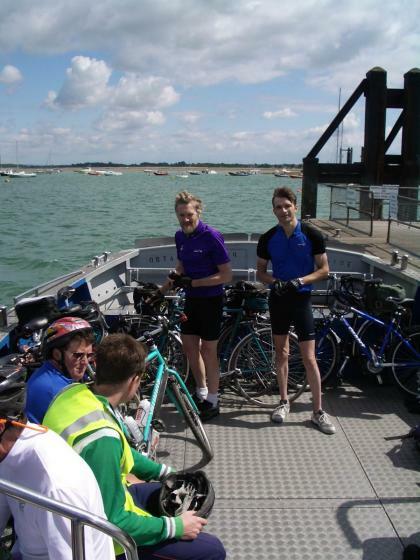 Phil lifted the bikes over the Gate at the Pagham end of Summer Lane and Arthur caught them. The group then headed up the B road to the Royal Oak. After meeting another 10 riders from Bognor making for a record turnout for the year the group took a direct route back via Runcton and Vinnetrow road. 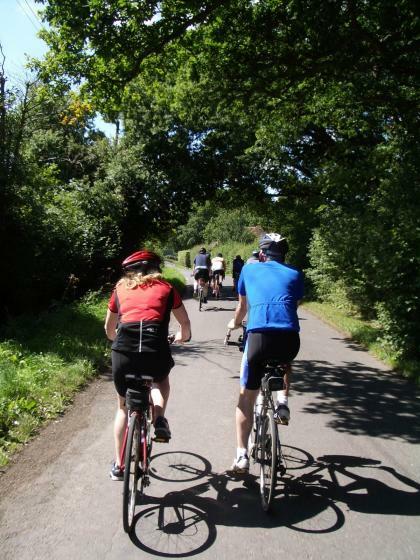 Wednesday 17 August, Evening Ride, Felpham Start. On a beautiful sunny evening 8 started from Felpham. Myself, Graham, Roy and Anne, Chris, Julian, John, and Val. We headed out on backroads through Felpham to the footpath going across the Rife to the Felpham bypass. It was then that an incident filled evening started. Just as we turned onto the footpath and still out of sight of the bypass we heard an almighty bang. We headed on up to the bypass and the lights crossing and 100 yards up towards the Leisure Centre 2 cars were skewed across the road with the front ends caved in from an apparent head on collision and a van also involved was sideways into the grass verge. One car was still smoking with the engine revving possibly from a drivers foot being jammed on the accelerator. Some nearby car drivers made mobile phone calls to the emergency services and others helped get some of the occupants out of the cars. One seemed still to be trapped when the ambulance and Paramedics arrived. With everything under control and as we were running late we headed on taking the cyclepath round the playing fields and lanes to the cyclepath to the coach park and then through town and up Linden Road to North Bersted. 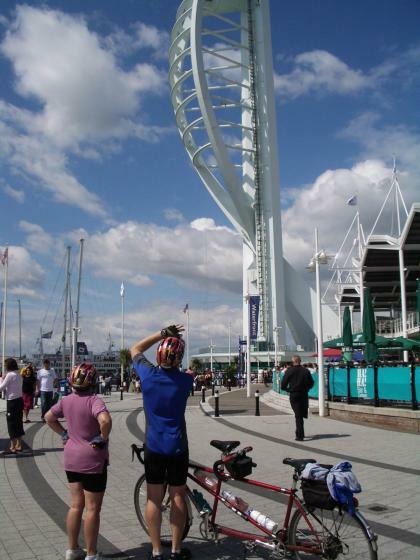 We took the cycleroute round the estates to the cycle crossing of the A259. Here the next incident occurred with a spot of road rage. A small car pulled out of a side turning narrowly avoiding a collision with another car on the main road. The other car hooted the small car. Then a few hundred yards up the road the small car driver jammed on his brakes and leapt out of his car obviously incensed at being hooted and started running back toward the other car which had stopped just behind him. The other car then did a smoking wheels reverse (Dukes of Hazzard style) to get out of range and eventually they both drove off. Worried by now about when incident number 3 would hit us we headed on up the cyclepath and then Merston and Runcton to the Royal Oak. I had arranged to meet Dawn and Fred at North Bersted but we were quite late getting there because of the accident so they had made their own way to the Pub. 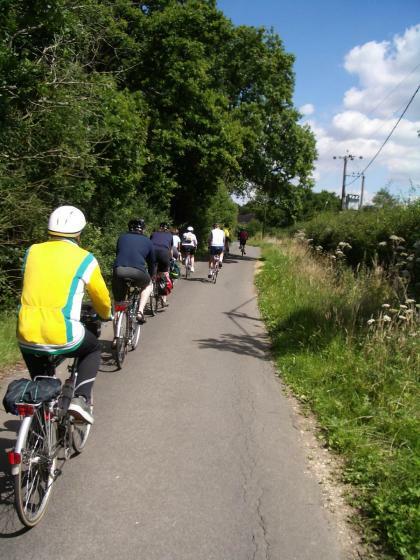 We met 9 on the Chichester ride making a record total turnout of 19 for the evening. We returned on the B Road to Aldwick/Rose Green and I deputised Graham to lead back to Felpham while I turned off for home.